Biological life is one thing. "Human" life is something more. Human beings, uniquely, create the world in which they most immediately live. We do not live in any kind of unmediated relationship with "nature." In fact, we live in structures, and communities, and our "civilization," as a human accomplishment, requires the creation and occupation of cities. Most of the large-scale conflicts of the 20th century were predominantly rural, with urban battles such as Stalingrad being the exception rather than the rule. Mao Zedong called on the guerrilla to move among the people like the fish in the sea, thinking of China’s rural peasantry. But today, nonstate armed groups — such as rebel groups and sectarian militias — more easily find ways to blend in with the population, raise more funds, and hinder government crackdowns in cities. Governments and their militaries should be aware of the urgency of rehabilitating urban services and, when possible, leave them intact. The ICRC has advised warring parties, for instance, to avoid the use of explosive weapons in densely inhabited areas and to steer away from infrastructure that will be critical for civilian populations. There are strategic reasons for this, alongside humanitarian ones: The long-term instability and underdevelopment that follows armed conflict can fuel local tensions and increase the risk of relapsing into conflict. As cities expand across the developing world, preventing and de-escalating protracted urban conflict is one of the most critical strategic and humanitarian challenges of our time. 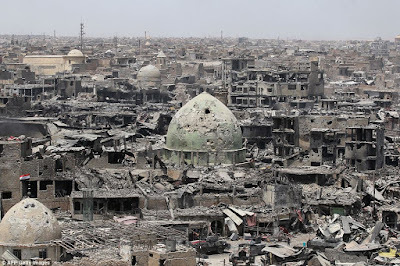 I say that these observations are phrased "politely" because I find the subliminal message, above, to be an acceptance that we will, in fact, continue to do to cities what the picture shows that we have done to Mosul. Sure, it would be "better" if cities were not destroyed. That should be avoided "if possible." That is what the article seems to say. Well, the urgency is far greater than that. 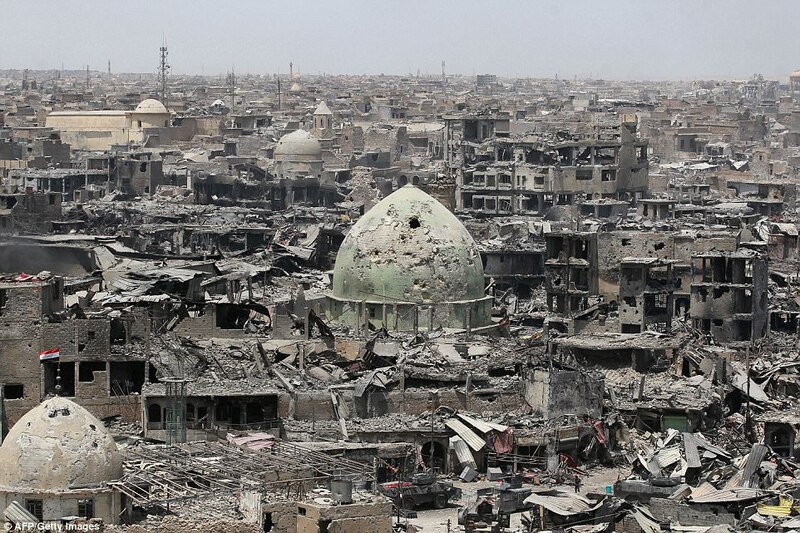 When we allow war to destroy cities, we are "ending the world" for all those who lived there. We are destroying civilization at its root. It is an illusion to think that this is not our problem, we whose cities have not yet been destroyed. Putting an end to civilization, anywhere, is a peril to us all.